Alex Ritman, Hollywood Reporter про видовищну сцену стрічки Крістофера Маккуоррі «Місія неможлива: Фолаут», в якій Абу-Дабі замінив Париж. Tom Cruise’s 25,000-foot HALO stunt involved two UAE military planes and more than 100 jumps over the desert (which later became France). In 2011, for Mission: Impossible – Ghost Protocol, Tom Cruise famously flung himself from an open window about two thirds up Dubai’s Burj Khalifa – aka the world’s tallest tower at some 2,716 feet – serving up one of the franchise’s most heart-stopping stunts. While the plot involves Cruise (as Ethan Hunt) descending dramatically into Paris, the shoot actually saw the actor and production return to the United Arab Emirates in the Middle East, this time in Abu Dhabi just up the road from Dubai (the French countryside was added in post-production). And it was a stunt that required the intense cooperation of the UAE military, alongside two planes and more than 100 jumps out over the desert. “Paramount were looking specifically for a C-17 aircraft, which is not available in many parts of the world,” says Maryan Eid AlMheiri, CEO of twofour54, the Abu Dhabi media zone authority that worked alongside the Abu Dhabi Film Commission, the armed forces and the film producers on the logistics of the stunt. But it wasn’t just an aircraft – alongside the personnel and pilots – that the UAE armed forces provided, with production also given a hangar at the military base from which to run their operations, alongside a number of other essential elements. “42 of those were on the C-17 and 52 on the Twin Otter,” says Abdallah. As for Abu Dhabi, films such as Star Wars: The Force Awakens and Furious 7 – both of which shot extensively in the Emirate – have given it ample opportunity to shout about its growing status as a location for major Hollywood blockbusters. 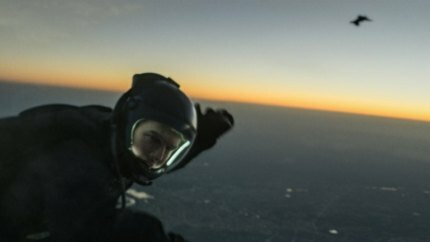 But with any clues as to Mission: Impossible – Fallout’s Middle East credentials having been all but erased from the film’s final cut, Abu Dhabi may this time simply have to contend with providing the necessary resources – and airspace – for one of this year’s most audacious Hollywood stunts.